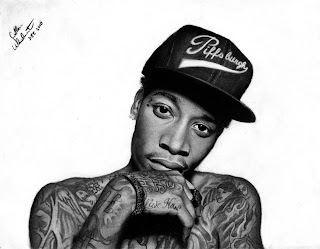 Cameron Jibril Thomaz was born September 8 "87", stage name Wiz Khalifa, hails from the state of North Dakota. His first album Show and Prove was released in 2006, Show and Prove, Leading to a record deal with Warner Bros Record in "07". Wiz Khalifa songs such as "Say Yeah", received a substantial amount of music spins. A mixtape and a few songs later, Wiz Khalifas music was on the Rhythmic Top 40 along with Hot Rap Tracks charts in 2008. Khalifa left Warner Bros. then released his 2nd album, Deal or No Deal, in 2009. He was an entertainment phenomenom from blogs to mixtapes. The mixtape Kush and Orange Juice was released as a free download in April 2010; he later signed a deal Atlantic Records. There he released a hip hop banger that topped the charts even more so than any other, "Black and Yellow", which peaked to number 1 on the Billboard Hot 100. His debut album for the label, Rolling Papers, was released on March 29, 2011.